By helping to support endowed chairs, we play a role in attracting some of the world’s top researchers and leaders to UB—including Anne B. Curtis, MD, Charles and Mary Bauer Professor and Chair of the Department of Medicine, and a UB Distinguished Professor. 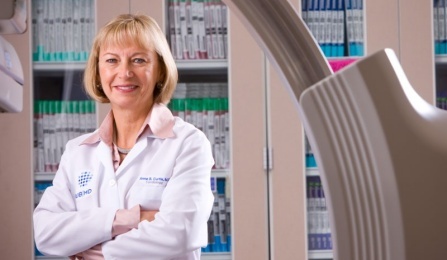 Anne Curtis, MD, is the Charles and Mary Bauer Professor and Chair of the Department of Medicine, and a UB Distinguished Professor. As one of the world’s leading clinical cardiac electrophysiologists and an expert in cardiac arrhythmias, she played a key role in developing national treatment guidelines for treating atrial fibrillation. In addition, her clinical research has significantly advanced knowledge of human cardiac electrophysiology and heart-rhythm abnormalities. She is a past president of the Heart Rhythm Society and the former chair of the Food and Drug Administration’s Circulatory System Devices Panel. At the UB Foundation, we are proud to play a significant role in recruiting and retaining renowned faculty, by enabling donors to direct funds to a specific purpose such as an endowed chair. Curtis recently answered some questions about her work at UB; here’s what she had to say. 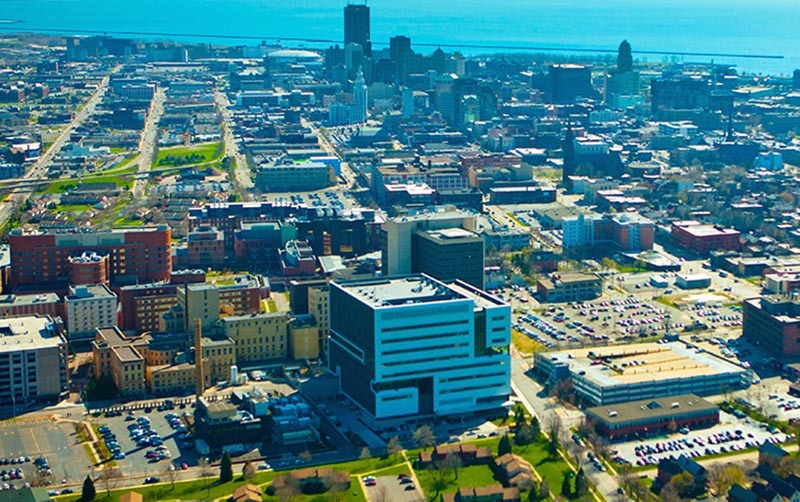 What opportunities attracted you to UB? Curtis: The opportunity to be chair, and to lead a large, diverse department. In previous positions, I had worked building sections and then divisions, but I hadn’t led a whole department. Here, I have the ability to have an impact on a wider range of issues, including education, research and clinical care. Curtis: There’s a lot going on here. There’s a vision coming from the dean of the Jacobs School of Medicine about how to grow the institution, and there’s clearly a vision of excellence in every facet of what we do. What we’re building right now—the new medical school on the Buffalo Niagara Medical Campus, as well as the Gates Vascular Institute, the new Women and Children’s Hospital and Conventus—it’s amazing when you see the growth that’s happening here. As the Charles and Mary Bauer Professor, how has philanthropy allowed you to continue your teaching and life-saving research? Curtis: The support from the Bauer chair allows me the funds to invest the way that I think best supports teaching and research. For example, I’ve had some residents and fellows who wanted to do research projects with me, and the funds have helped cover some of the expenses. One of our former residents—now a cardiology fellow—presented his research at a national American Heart Association meeting and is now preparing a manuscript for publication, all based on work that was supported by the Bauer chair funds. Curtis: The state can support us in terms of salaries that cover the educational mission. But for any faculty who are going to have a research career, there’s a gap in terms of what we need to be competitive, and what the medical school can provide. You can make it up in clinical care, but if someone is a promising researcher and they want to spend time writing grants and doing research—which we want, because that’s how new medical knowledge is generated—we need to be able to support them up front, and give them the time they need to get grants so eventually they can be self-supportive. The best way we can do that is through gifts and other philanthropic funds. And we still need more—more research funds, more endowed chairs—that allow us to do things like pilot studies, which can be turned into grants later on. We only have three endowed chairs specific to the department. Many of the division chiefs don’t have them, which means they don’t have the flexibility in terms of bridging gaps in funding, or helping people publish their research and present at national meetings. Curtis: I very much appreciate what they’ve done. They have enabled us to do more—and move faster—because we’ve had that kind of flexible support. I can look department-wide and determine where the best use of funds should be. It also allows us to attract some of the best academicians by having not only the title, but also the funds needed to support them. The late Charles D. Bauer, MD ’46, and his wife, Mary Schweitzer Bauer, in 2008 endowed the Charles and Mary Bauer Chair in the Department of Medicine. The Bauers, who had given generously to UB and the medical school since early in their careers, also supported scholarships and the creation of a clinical research nurse manager position in the UB Clinical and Translational Research Center. Bauer received the UB Alumni Association’s highest honor, the Samuel P. Capen Award, in 2014. An internist and clinical instructor, he practiced more than 40 years in Western New York. He served as a member of the medical school’s Dean’s Advisory Council from 1998 to 2006. Mrs. Bauer, who worked as an RN during her career, and her husband were married 66 years, and had five children and 15 grandchildren.